T10 wedge bulbs, used in many campers and caravans and cabin lights. 1x T10 bulb Multivoltage, this can operate from 8-30v dc. 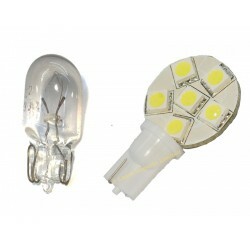 It replaces the common T10 or 5w5 ..
1x T10 bulb Multivoltage with 9SMD leds. This can operate from 8-30v dc.It replaces the common T..